Askold's Grave is a part of the park complex on the right bank of the Dnepr River. In ancient days this area was called Ygorskoe Urochishe. According to a legend, on this very site near the Dnepr River in 882 prince Oleg killed sons of Kie, princes Askold and Dir. Then he ascended the prince throne and became a very successful ruler of Rus. As for Askold and his brother, they were buried on the place where they were killed. According chronicles, Askold was honored by Kievers. There are reports that he was baptized in Tsargrad in the 860s taking the name Nicholas and that he tried to convert Rus to Christianity. 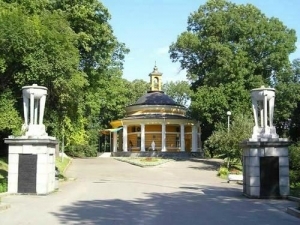 However, some historians offer a hypothesis that the story of Askold and Dir murder is just folklore, but still people consider Askold's Grave to be the place of Kiev prince burial. The site of Askold's tragic death was marked by constructing a small wooden chapel. In 1810 architect Melenskii constructed a stone Saint Nicolas church shaped as rotunda instead of old wooden one. Later it was rebuilt and turned into a park pavilion. In 1935 a colonnade was added to the construction, and it is the way the pavilion has remained until nowadays. In the 19th century a small cemetery was founded around Askold's grave. Many outstanding persons were buried there. Among them were medical professor Mering, famous pilot, the author of dead loop Nesterov and some others. The cemetery existed until 1935. When the area of Askold's Grave turned into park zone, all the burial places were transferred to other cemeteries. A wooden cross indicates that the young Ukranian patriots killed in the battle with the Bolsheviks near the Kruty station were buried in the cemetery in 1918. Their remains were also transferred. This picturesque place has always been surrounded with mystic legends and stories. It attracted attention of Kiev citizens and guests of the city, as well as art creators. Taras Shevshenko dedicated his works to Askold's Grave, writer Zagorskiy wrote a novel about this historical place, and it underlay libretto of opera by Verestovsky. This opera became very popular, and one can still see it in a number of Ukrainian modern theaters. Near Askold's Grave there is a monument to Apostle Andrew the First-Called, a very important saint for Kiev and its citizens. According to Nestor's Russian Primary Chronicle, two thousands years ago Andrew the Apostle, while wandering around the Scythian land and preaching Christianity, blessed the hilly bank of the Dnepr River and forecasted glory to Jerusalem of Russian lands. The monument to Andrew the First-Called emphasizes importance of the saint for Kiev. The sculpture designed by master Shvetsov is made of solid piece of granite. It immortalizes glorious deeds of Saint Andrew the Apostle. The Kiev Hotels supplies the most helpful and up-to-date information on the best hotels of Kiev - an administrative, economic, scientific, cultural and educational center of independent Ukraine and one of the biggest cities in Europe. With the help of our website containing detailed information on hotels, room facilities and rates you can easily reserve a room in any hotel of Kiev through our online reservation system.